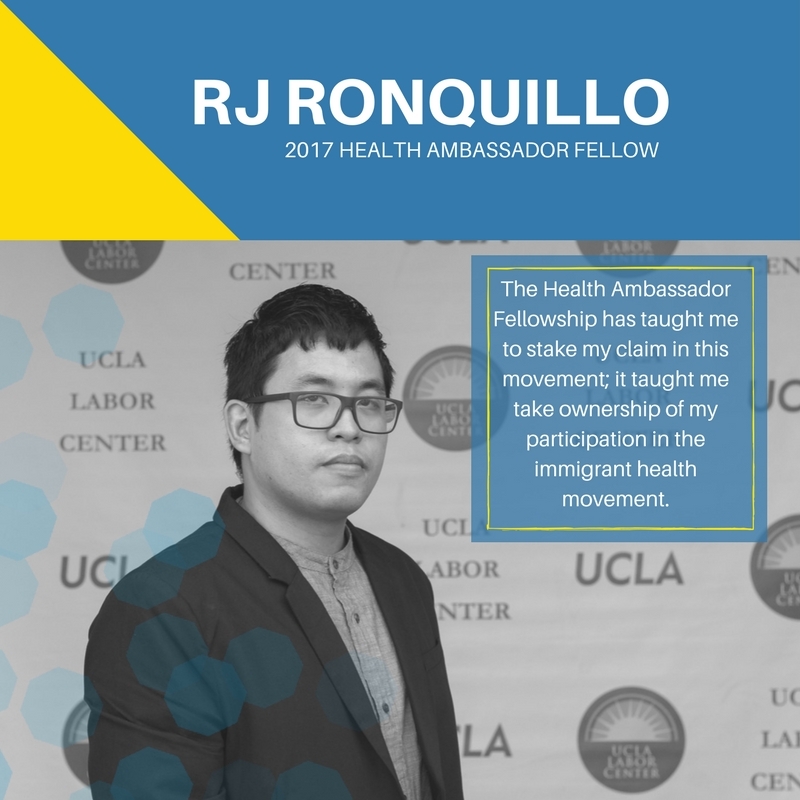 RJ Ronquillo is a Health Ambassador Fellow based in Los Angeles County, specifically working with the Asian America Pacific Islander (AAPI) community. 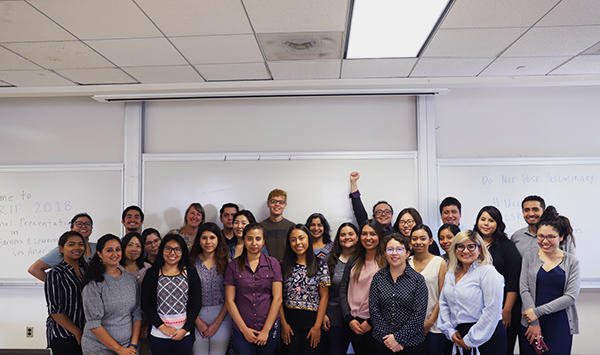 RJ works at Asian Americans Advancing Justice-LA, where he informs communities on health programs and educates undocumented immigrants about their rights to access health services. My inspiration comes from people that I have met in this life: from my parents to my brothers to my friends. 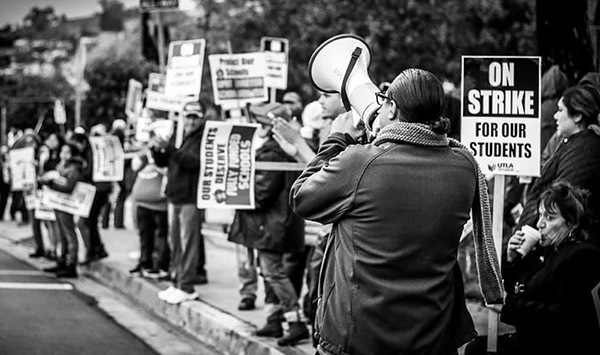 People that continue to fight for, not only of their dignity, but of their community and the community around them. People who can smile and still continue the nuances in life despite of all the noise around them. It is the tenacity and resilience of the amazing people that I have met are my inspiration. Being a Health Ambassador fellow allowed me the opportunity to both grow and learn professionally and individually. Being able to work from a group of amazing, talented and committed individuals, and to learn from them has been the most fulfilling part of this experience. Shout to the HAP team (Leslie, Doreena, Janelle, Marianna, Katelyn, Eddie, Weiyu), and DRC supervisors (Alma, Marianna). Furthermore, the Health Ambassador Fellowship has taught me to stake my claim in this movement; it taught me take ownership of my participation in the immigrant health movement. How has the Health Ambassador Fellowship shaped you and provided a platform for you to move forward in your career? The Health Ambassador Fellowship was very intentional in the placement of their fellows. We were place in organizations where are potential as health advocates will be maximized. As such, the Health Ambassador Fellowship has given me a platform where I can develop my networks in the health field, but most importantly to learn from the most amazing and committed set of people has given me the chance to further my growth in my career. As of the writing/publishing of this article: I am not particularly sure. I have been thinking/planning of applying for grad school, but as an undocumented individual in this political climate that plan might not go as I want it. So, I like to take things one step at a time; because knowing myself, I would stress myself out if my future plans do not pan out. I would forget to enjoy the present (e.g. being with friends and family), and fret about the hypotheticals of life—the “what ifs”. So I take it day by day and try to make lemonades out of every lemon that has and will continue to be thrown at us. My advice to future Health Ambassador fellows would be to think of this Fellowship as more than a fellowship that can help boost our resume and/or get paid (although those are very integral part of the program), but rather as an opportunity to be part of spaces where we can advocate for our friends, families and community. Opportunities that are provided in this fellowship are very rare: inclusion of directly impacted community members in conversations that impact us are too far and few in between. To provide us with an avenue to have our voices heard and to insure that decision-makers will not forget us is an indispensable resource because our voice and our health matters. As an undocumented individual, I know of the frustration when decisions are made for our community and not by our community. Community members who will face the brunt of the decision should have a seat at the table when deliberations are being made about their community, because they are the ones the understand the nuances and the impacts those decisions. Furthermore, solutions that are provided by the community, have usually been the most effective. These among many other reasons are why it is important that we work with the community. What do you enjoy doing outside work, do you have any hobbies, talents, likings?